Facebook has forever changed the way people interact with each other through the internet. Never before have so many people been able to connect from every part of the world through a medium such as this. 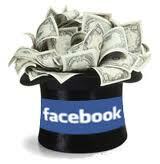 The real magic of Facebook is its viral potential. Most people do NOT utilize this to its full potential.